Undefeated Marthin Hamlet (5-0 / #6 Nordic LHW) will fight for the Light Heavyweight Cage Warriors title versus Modestas Bukauskas (8-2) on June 29th at Cage Warriors 106 in London. Read the press release by the promotion below. Cage Warriors confirm yet another world title fight for their mammoth June 29th card – undefeated Norwegian superstar hMarthin Hamlet vs rising UK powerhouse Modestas Bukauskas for the light heavyweight belt. There’s no stopping Cage Warriors’ efforts to ensure June 29th is the biggest night in the history of the promotion, and the latest addition is a European showdown for the light heavyweight title formerly held by MMA legend Michael ‘The Count’ Bisping. Norwegian national hero Marthin Hamlet is a 7-time national wrestling champion and has picked up 15 World Cup medals in his illustrious wrestling career. 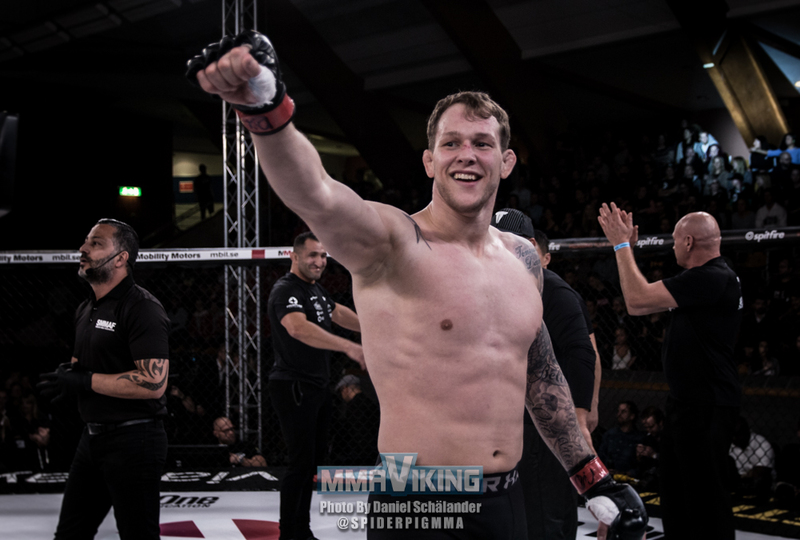 Much like Olympic medallist Mark O. Madsen – now a top contender in Cage Warriors’ welterweight division – Hamlet is one of the most credentialed Scandinavian athletes to put on the yellow gloves and test his skills in Europe’s leading MMA promotion. Hamlet made the switch to MMA in 2017, and signed to the Cage Warriors Academy Denmark a year later. Since his debut he’s picked up 5 straight wins including 2 knockouts and 2 submissions. Meeting Hamlet on June 29th is Modestas Bukauskas, now on a 4-fight win streak, whose incredible comeback win over Marcin Wójcik was one of the highlights of the night during Cage Warriors’ last visit to London earlier in the year. Bukauskas vs Hamlet is the fifth of six world title fights set for CW106: Night of Champions, alongside Jack Grant vs Jai Herbert, Nicolas Dalby vs Ross Houston, James Webb vs Nathias Frederick and a featherweight title defence from champion Dean Trueman. Cage Warriors can confirm that Trueman’s previous opponent Søren Bak is no longer willing to cut the weight necessary to make the 145lbs featherweight limit, and so will be returning to lightweight. President Graham Boylan has teased that a new opponent is very soon to be confirmed.